Catherine Beck, an adjunct professor in the University of Wyoming School of Nursing, is one of only 10 nurses nationwide to be seated on a national panel. Beck, who serves on UW's BRAND (Bachelors Reach for Accelerated Nursing Degree) program, was nominated to serve on the RN Practice Analysis Expert Panel for the National Council of State Boards of Nursing. She was nominated by the Wyoming State Board of Nursing. The expert panel takes part in the process of developing the NCLEX-RN exam, which every nursing student across the nation must pass to be able to become a registered nurse. Beck meshes her academic experiences in UW's BRAND program with clinical practice through her position as clinical supervisor at the Primary Care Unit at St. John's Medical Center in Jackson. She believes her dual role gives her insights that may be helpful to the practice analysis panel. "Having a foot in both the academic and practice worlds helps me expose the students to a glimpse of the real world of nursing, and gives me an understanding working with new nurses transitioning into their professional roles," she says. "It is an honor for me to be a part of a stellar team of professionals at the Fay W. Whitney School of Nursing, who are committed to laying the foundation for student nurses. "I have a great passion for nursing and for our responsibility as a profession to constantly be growing the next generation of nurses." Hoping to inspire other nurses to make a similar commitment, Beck developed an on-line preceptor workshop during her master's studies. She encourages nurses to become preceptors, which are experienced nurses who work alongside student nurses, overseeing their application of knowledge and skills in a practice setting. 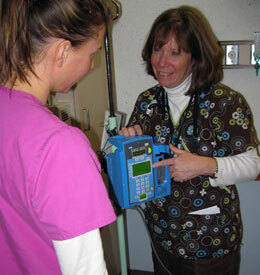 An accelerated BSN program for students who have earned a previous non-nursing baccalaureate degree but decided to change careers and become a registered nurse, BRAND offers a win-win for its graduates, who can benefit from the program's generous loan repayment plan, and the state's healthcare industry, which desperately needs skilled and qualified nurses to work in hospitals in Wyoming communities.